Courtesy of Phil White, Lake Memphremagog between Vermont, USA and Québec, Canada. On July 18th, seven swimmers between the ages of 14 and 69 faced oncoming stiff (16-32 kph) winds, high waves and turbulent chop for the first 15 miles of In Search of Memphre. The conditions were so rough that only two of the seven completed the 25-mile cross-border swim between Newport, Vermont and Magog, Québec, Canada. 37-year-old Sharessa Gutierrez of Omaha, Nebraska completed was first in 15 hours 51 minutes with 14-year-old Vera Rivard of Springfield, New Hampshire in 16 hours 24 minutes. 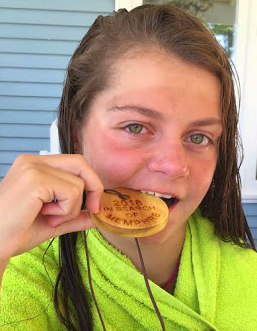 In doing so, Rivard became the youngest person to cross the 40.2 km of Lake Memphremagog despite swimming through some of the most challenging conditions of the lake. "Very impressive was the last 25 meters of her swim," commented Steven Munatones. "In the dark of night, she came upon the Canadian shore swimming solidly, but then she quickly sprang to her feet when she hit the shallow water. Despite a bit of a momentary wobble, she got her sea legs under her and literally jogged the last few steps to the shore. 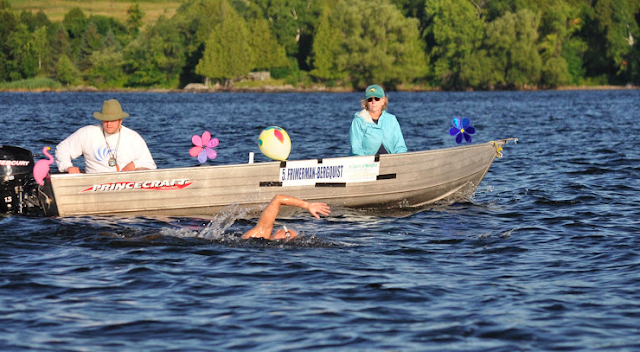 Her strength of character and commitment to finishing a 16+ hour swim was so evident in that last short stretch across Memphremagog." Phil White reported on the rest of the swimmers. "They laid down inspiring swims and completed various distances fighting these headwinds. 28-year-old Cara Manlandro of Derwood, Maryland completed 23.5 miles before communication difficulties regarding the landing location caused her to end her swim, just short of the finish. 34-year-old Sandra Frimerman-Bergquist of Exelsior, Minnesota, 57-year-old Eric Schall of Kingston, Pennsylvania, 69-year-old Dan Shub of Baltimore, Maryland, and 41-year-old Mary Stella Stabinsky of Plains, Pennsylvania completed various distances ranging from 6 to 17 miles. 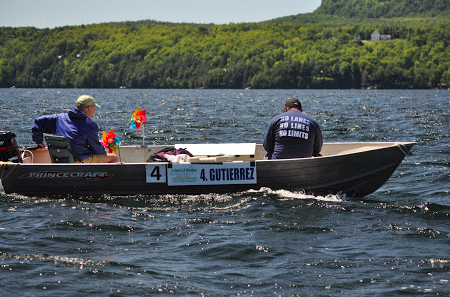 Shub was the oldest person to attempt a Memphremagog crossing and the last of the swimmers to abort the swim at 17 miles. His was a great and truly inspiring bit of swimming. The swim started at the EastSide Restaurant in Newport, Vermont at 5:31 am as the sun began to rise. The water temperature ranged from 72°F to 74°F (22-23°C) throughout the day with sunny skies and air temperatures in the 60°F's and 70°F's. The high winds began to diminish around noon. After the bend in the lake at Georgeville, they became cross winds of 8 to 16 kph." This year’s class of Swimmer Scouts dedicated their swims to the Asylum Seekers and encouraged donations to the Asylum Seeker Advocacy Project.